February 11, 2019 update: The Council closed the formal comment period on the Columbia River Basin Fish and Wildlife Program recommendations on February 8. See recommendations and comments. The end of the formal comment period on the recommendations does not signal the end of the Council’s public process for amending the Fish and Wildlife Program. The Council will now assess the recommendations and comments and prepare draft program amendments. Interested persons and organizations may continue to make their views known to the Council on any issue associated with the program amendment process. The Council will release draft program amendments for another formal public review and comment process later this year. 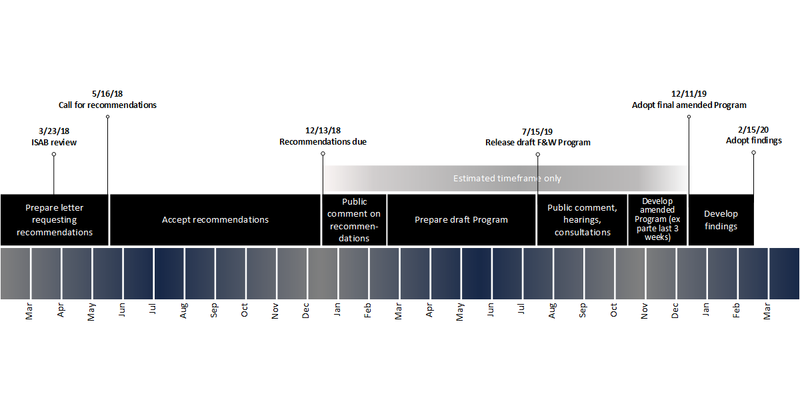 January 2019 update: The official comment period on the program amendment recommendations ends on February 8, 2019. The Council considered whether to extend the comment period due to the partial shutdown of the federal government, but closing the official comment period on the recommendations enables the Council to begin drafting the amended program. However, the Council will continue to receive written and oral public comment on the recommendations as the amendment process continues and provide opportunities for public comment at its regularly scheduled meetings. The Council urges those wishing to submit comment on the recommendations but hindered by the government shutdown to do so as soon as possible to inform the development of the draft amended program. The Council invites your review and comment on the recommendations the Council received to amend its 2014 Columbia River Basin Fish and Wildlife Program. Please submit your comments on the recommendations no later than February 8, 2019. Consistent with the Northwest Power Act of 1980, the Council develops and periodically amends its fish and wildlife program for the Columbia River Basin to protect and enhance fish and wildlife affected by the development and operation of hydroelectric facilities, while assuring the Pacific Northwest an adequate, efficient, economical, and reliable power supply. The Act requires the Council to call for recommendations to amend the program at least every five years prior to the Council’s review of its regional electric power and conservation plan. Last May, the Council issued a call for program amendment recommendations. The deadline for submissions was December 13, 2018. The Council now seeks public comment on the recommendations, as required by the Northwest Power Act.